Sally Muccio's had her crosses to bear: a cheating ex-boyfriend, crazy Italian parents, and an unfaithful husband, just to name a few. 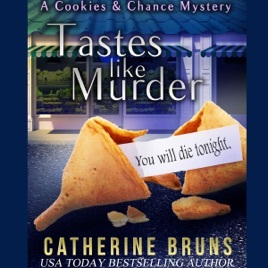 After her divorce, she returns to her hometown to start a novelty cookie shop whose specialties include original fortune cookies, served with a sprinkle of foreshadowing. But there's no warning when her ex-husband's mistress drops dead on Sal's porch, and police confirm it's a homicide. Determined to stop her life from becoming a recipe for disaster, Sal takes matters into her own hands. With two very different men vying for her affection, dead bodies piling up, and a reputation hanging by an apron string, Sal finds herself in a race against time to save both her business and life - before the last cookie crumbles.